Iran's President Hasan Rouhani, center, leaves the parliament at the end of his swearing-in ceremony for the second term in office, in Tehran, Iran, Aug. 5, 2017. Iran’s parliament is set to hold a special session as soon as Sunday to discuss the anti-government protests that began Dec. 28 and continued through this week. U.S. President Donald Trump is set to decide next week whether to continue waiving sanctions on Iran that were suspended under the 2015 international deal on Iran’s nuclear program. The waiver must be renewed every 120 days, according to U.S. law. Trump could decide not to renew, putting U.S. trade sanctions back into effect. 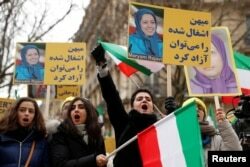 People demonstrate in solidarity with anti-government protests in Iran near the Iranian embassy in Paris, France, Jan. 6, 2018. At least 22 people have died in the protests, and more than 1,000 have been arrested. Hard-line cleric Ahmad Khatami told worshippers in a sermon Friday that those arrested should be treated as enemies of Islam, particularly those who have burned the flag. “There should be no mercy for them,” he said. Iranian Foreign Minister Mohammad Javad Zarif attends the 72nd United Nations General Assembly at U.N. Headquarters in New York, Sept. 20, 2017. Critics of Iranian President Hassan Rouhani say he has abandoned the poor, pointing to rising prices for key commodities like fuel, bread and eggs.